Today I found a package in my box of Sheng Puer that I haven’t yet opened (let’s be honest, there’s two boxes of Sheng Puer and many unopened packages, but I digress). This beauty is from my last trip up to Camellia Sinensis in Montreal. I remember having it recommended to me by one of their tea crew, and being intoxicated by the smell of the leaves. Much like the aroma of roasting oolong in Pinglin, the crisp fruity sweetness of Máochá brings back memories of walking around tea factories in Southern Yunnan. Máochá is so fun to brew: toss a pile of it into a gaiwan and pour on the boiling water. The result? A golden cup of thick liquor with the taste of freshly cut hay. There’s also a floral component, like the sweetness of honeysuckle, that I find very comforting. A mineral overtone is unmistakeable, but it doesn’t result in a overly dry mouth feel. That honeysuckle sweetness is more prevalent in this Laos tea than in other Máochá that I remember. It’s not really a perfume, but more a gentle sweetness that just tickles the senses. So, if you’ve read this far and have no idea what kind of tea I’m drinking, maybe I should explain a little about Máochá (毛茶 or sometimes Mao Cha). Most Máochá is steamed and then pressed into cakes, producing Puer as it ages. Some, however, is left raw, and this is the tea that a lot of the locals in Puer-producing regions drink as their daily beverage. Made with minimal processing, Máochá has very little in common with the Puer that much of it becomes, evolving much more like a Green, or even a White tea. Characterized by large, wildly twisted leaves that glow with a green and gold energy, Máochá can harbor some delicious flavors that are not seen in any other tea category. In fact, I’d much prefer to think of Máochá as its own type of tea rather than trying to explain how it comes from a world of Puer, but acts like Green tea. As I’ve written about before, most tea drinkers in the tea producing regions of China don’t drink tea gong-fu style, nor with western style strainers, but grampa style: just leaves in a jar with hot water. Máochá lends itself really well to this style of drinking. The massive leaves just melt as you pour in the water. It’s a beautiful thing. Máochá is great for every day drinking, and usually rather inexpensive compared to Sheng cakes from the same region. Like other tea (outside the Hēi chá category), I’d say that Máochá is better within the first year after harvest. It can be aged, but in my experience the flavors can become overly dry and dull the older it becomes, unless aged very skillfully. I imagine that the process of pressing Máochá into Sheng Puer cakes offers the leaves some protection against the elements which the raw tea doesn’t have. Then again, I have tried fewer than six different Máochá in my time, so please conduct your own research and let me know! This entry was posted in Tastings and tagged laos, maocha, puer, yunnan on December 8, 2015 by payton. I wish I had a better name for this tea, but it’s a little bit of a mystery. A birthday present from my friend Ben, these leaves are a blend of various Taiwan-grown cultivars carefully aged since 1993. This is such a fascinating tea! The flavors are very difficult to describe. Woody and earthy for certain, but not like a Shou Puer. This is more the woodiness that you get when munching on wild blueberries and a bit of stem or leaf ends up in your mouth. In fact, wild blueberries are a good metaphor for what I taste in my cup. Sweet and earthy with a light perfume. The liquor is a golden orange in the cup, and has the aroma of a freshly toasted pie crust, hot out of the oven. Honestly, every time I smell the warm scents coming from this tea my brain is confused because they seem like a cross between the caramel roast of a Wuyi cliff tea (Yan Cha) and the fruitiness of lightly toasted Dong Ding. The flavor reminds me a little of a 1982 Bao Zhong from Red Blossom (apparently I haven’t reviewed that one yet, but here’s a similar tea): sweet and fruity but also heavily roasted. I wasn’t able to find out exactly what leaves are in here, but I wouldn’t be surprised to learn that there’s a good quotient of tea from Pinglin, where Bao Zhong is made. What a wonderful gift, and I bow humbly to Ben for his kindness, my cup of tea steaming in my hands. This entry was posted in Tastings on November 25, 2015 by payton. I make a fair amount of tea during the average day. By the time some evenings roll around I’ve brewed three or four pots of different teas, each one usually three to six times. One thing that this practice has shown me is that not all tea preparation is equal. Many infusions end up being brewed while I’m working, reading something on the Internet, or having a deep conversation. The result? The tea becomes just another beverage. That’s not my preference, of course. I’d much rather be aware of my tea making. Not only does a carefully, mindfully prepared cup of tea taste much better, the experience of making the tea itself becomes enjoyable. I’ve written about “tea as meditation” before, but today I was struck by one particular aspect: patience. One of the most interesting and unique parts of making tea by hand is the steeping time. The way I see it, this single factor sets it apart from other artisan beverages like wine, beer, whiskey, etc. To make the best tea, we have to be very careful about how long the leaves sit in the water. Too long, and a bitter cup of tea results; too short, and a watery cup is what you get. While using a timer is almost essential when starting out, as familiarity develops the practitioner gains an intuitive sense of when to pour out the pot. Either way, we must wait, and wait, and wait, but not be distracted! Our awareness must remain on the tea as it sits there in silence. A vigil of the leaf. While waiting for thirty seconds or two minutes can certainly be annoying at times, I see this as a wonderful part of the practice of tea! Annoyance, after all, only appears when we’d rather be doing something else. When it arises, I try to notice that it’s arisen by saying to myself, “well, now I am annoyed; how interesting! I want this tea to be complete so I can go do something. This is what restlessness feels like.” And then I wait, and wait, until the tea is ready. I encourage everyone to try this practice! Being present with the emotions when we resist an experience can be very interesting indeed! And what a short meditation it is: the time it takes to steep a pot of tea. In many cases less than a minute! Better still, the result is not just learning about our own mind or cultivating patience, but we get a delicious cup of tea as the icing on the cake. If only all practices of meditation could have such a tangible reward. This entry was posted in Method and tagged meditation on November 9, 2015 by payton. The super rich, spinach-and-seaweed aroma of a Japanese green tea is the result of many different factors. One technique pioneered by Japanese tea farmers is the practice of covering some of their plants for a few weeks just before harvest. The covers are permeable mesh or bamboo, allowing only a little sunlight to reach the tea during this period. The result of this practice darkens the leaf as the plant tries to produce more chlorophyll in its attempts to reach the sun. When these covered teas are harvested, they become either Gyokuro, the most savory of green teas; Tencha, used to make powdered Matcha; or Kabusecha, a unique form of Sencha that is a real treat for the senses. A recent excursion allowed the purchase of some Kabusecha Saemidori from Camellia Sinensis tea house. I’m quite familiar with the covered Sencha served at Dobra tea room, and it’s always been one of my favorite green teas, but at most other tea shops I usually lean toward earthy Puer and heavenly Oolongs. I’m very glad that I made an exception here, and honestly I have to thank my wife and my good friends for picking this tea in the first place. The dark green leaves are finely cut into medium-size pieces, as is typical for all but the most rare tea made in Japan. Gently infused with relatively very cool water (approximately 50-70 degrees Celsius) they produce a light pea-green liquor that just radiates happiness. It’s not just the flavor, though. Let me share with you my favorite part of this ritual. I’ve mentioned it before, but one of the great joys of brewing loose leaf tea is getting to experience the aroma of the warmed leaves, and this is doubly true for Sencha. First, warm your tea pot. It doesn’t matter what kind of pot, although something with a mesh strainer is going to resulting infusion much more tasty. All you have to do here is pour hot water into the empty pot, let it sit for twenty seconds or so, then pour it out (you may as well warm your cups with the water when you’re done). Next, pour in some tea leaves. If you want to measure, I’d say around six grams of leaf per 200ml of water, but I usually don’t bother. Roughly two tablespoons is a good rule of thumb. Also – and this is a point that ruined many pots of Sencha for me in the past – don’t use a teapot that holds more than 400ml of water. For Japanese tea especially, the infusion will need to be very careful, and large pots make this nearly impossible. Just after adding the leaves, cover your tea pot with the lid, trapping the leaves in with the warm, moist air. Then comes the reward! After letting the leaves sit in the warm pot for around a minute, carefully lift the lid and stick your nose in. (Fair warning: if you heated the pot with boiling water, there may be steam escaping and you definitely don’t want to stick your nose in that! So it’s best to lift the lid, let any steam escape, and then inhale.) The resulting aroma is a life experience in itself. What if I don’t smell anything? It’s worth mentioning that if your tea is getting old (more than a year since harvest) or if it has been stored with too much exposure to air or light (often the case for tea purchased from jars or in clear containers), you may not get much aroma. Fresh and vacuum sealed tea will provide the best experience, but you can always try to warm the pot with hotter water and leave the tea inside for a longer period if you don’t smell anything. Chances are that if you don’t get a blast of deliciously savory aroma from the damp leaves, the taste of the infusion may be dull and flat. Assuming all goes well, steep your Sencha with warm (about 70°C) water for between 60 – 90 seconds. The exact count varies but you can solve this riddle by pouring out a small quantity of tea during the steep and tasting it to see if it’s ready. Be quick, though; a few seconds can make or break a Japanese tea! Even though it’s a tricky style of tea to get perfect, I really encourage everyone to try their hand at Sencha. The resulting incredible flavor and aroma you just can’t find in any other tea. Be patient with yourself, and when you smell the tea, really let it pervade your senses. This is the communion with nature that tea brings to us. It is a gift of the leaf, and more than worth the effort needed to find it. This entry was posted in Method, Tastings on October 31, 2015 by payton. This delightful surprise was sweet and quite chocolatey. I felt like I was drinking a fancy dark chocolate. The effect was notably drying but with a wonderfully thick mouth-feel that raised my spirits considerably after drinking (not that I was feeling particularly down to begin with, but still). I had the good fortune to stop by Stone Leaf Teahouse on my birthday for a few pots of Chá (actually, this “good fortune” was thanks to the wise suggestion of my wife). I enjoy every chance I have to talk to the owner, John, and this time he informed us that the shop had recently acquired not one, but TWO Nepalese second flushes (the summer harvest) from a well-known garden called Kuwapani. I’ve enjoyed many Kuwapani teas before, both first and second flush, and I’m always interested to try new lots. One of the versions that John had on tap was named “Kuwapani Royale”, and with a name like that I naturally I had to have a pot. At this point if you’re asking yourself, “but what kind of tea is this?”, what we’re looking at is a black tea (or red tea to be more accurate). But Nepal produces black tea with leaves that are more akin to Chinese cultivars than the large Assamica style so popular in Western black tea. The result is a light and very aromatic infusion modeled on the teas of the Darjeeling region of India, just over the mountains to the south. As I’ve mentioned a few times before, tea from Nepal and Darjeeling have become increasingly difficult to distinguish, and I think this is ultimately a good thing. Both regions are producing superb-quality leaf and I’m very happy to see such amazing tea coming from countries like Nepal who possess less of a tea-growing pedigree. Second flush leaves tend toward brown with hints of green left-over from the plant’s early-season energy. Compared with first flush leaves which can be mostly green with only a hint of darkness creeping in, you can definitely see the effects of a later harvest. Just like a first flush, well-made second flush leaves should be mostly full (unbroken) and leathery with at least a few tips present in the mix. This Kuwapani has everything I’d expect in appearance: tippy, hints of green and gold, small twisted leaf sets, but I suppose I might not pick it out of a crowd. The rich taste and chocolate aroma are what really sets it apart. A good three-minute steep was needed to really draw out the flavors from my second and third infusions, which is surprising given what I know about Darjeeling and Nepal teas. My experience has shown the style to be fairly delicate. It seems that this tea holds on to its energy tightly. A nice side effect of this was that there wasn’t a hint of bitterness in the cup afterward, which is definitely not what I was expecting. Altogether a great birthday tea (among many!) and one I’m going to be drinking again. If only all second flushes were this great. This entry was posted in Tastings and tagged black tea, nepal, secondflush, stoneleaf on September 24, 2015 by payton. When I saw that White2Tea had revived the legendary 2002 White Whale puer tea, I immediately placed my request. Google that tea, it has quite a reputation. It’s a shame to order only one item from such a noble company, though, right? I decided to add just one more tea to the order, conscious of my ever-expanding puer collection. Two-thirds of what I have are Sheng, so I felt justified to add a Shou to the list. I drink those more often anyway. (What’s Sheng and Shou?) At a recommendation from my friend Ben I tacked on a small Tuo from 1998 without too much of a name. Just an extra, right? An opener? Well… I need to tell you about this tea. Are you familiar with a Tuó? It’s a “nest” shaped chunk of pressed tea leaves, aged. I think it’s fair to say that most puer is shaped as a Bǐng (饼) or cake: basically a big disc somewhere between 100-400 grams. The other two most common shapes are the Zhuān (砖) or brick, and the ball-like Tuó (沱). The dry leaves on the Tuo don’t give much away. They’re certainly dark, yelling “Shou!”, (“ripe” tea, meaning accelerated aging) with just a hint of a reddish glow that implies a good storage. As soon as they enter the warmed pot, though: wow. Rich, earthy aromas. Like being in a bookstore. Not just any bookstore either, but one of those tiny, poorly ventilated shops in the unfashionable section of town with floor-to-ceiling stacks of yellow-edged Sci-Fi from twenty years ago. Is that not a common memory? Maybe I’m weird. Anyway, that’s what this tea brings to mind. A dusky red-black liquor promises wonders, and this tea does not disappoint. In the mouth it’s smooth and malty, with just a touch of dry sweetness. It’s been quite a while since I’ve had a treat like this. Both my wife and I immediately remembered our first trip to Camellia Sinensis in Montréal so many years ago, and drinking whatever aged beauty they had on the menu. It was like this. Sheer perfection in a cup. The tea was so thick that I started feeling full after just a few cups. But I had to keep going. About seven infusions later, the magic began to wane, and I was once again just a normal human sitting on a normal couch drinking a normal Shou puer. That’s not extreme longevity for a Shou. But for those seven infusions I was a god sitting on Mount Olympus supping on Ambrosia and Nectar. I hope you can relate. Even after number seven (this was with eight grams of leaf in a Jianshui pot) I managed to create at least four more infusions with a delicious earthiness that, if somewhat lighter, were still within the realm of enjoyable. 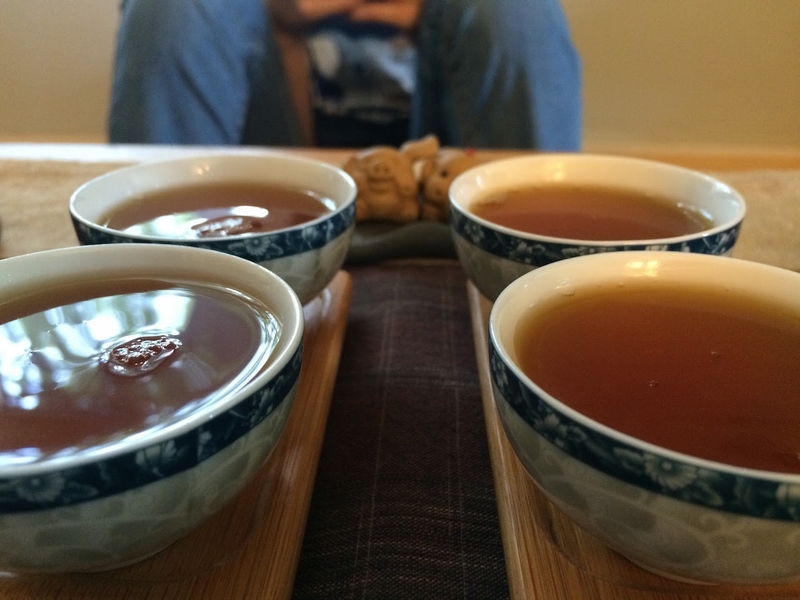 This entry was posted in Tastings and tagged aged, puer, shou, white2tea on August 27, 2015 by payton. Ever since I was fortunate enough to spend two weeks wandering around Yúnnán Province in the South-West of China, I’ve been in love with that region’s unique black tea (or more specifically 红茶 – Hōng Chá). When I came back from that trip I brought with me several hundred grams of tea made in the Lincang region (specifically Fengqing) which sated my thirst for a good two years before the last leaves were spent. And then: such sadness! In the time since I’ve naturally been trying to replenish my supply, and fortunately during my last visit to Camellia Sinensis tea house in Montréal I picked up two examples of this lovely style. I was planning to only buy one, of course, but it was difficult to tell from the descriptions which one I would like more. What’s a tea lover to do in that situation? Get one of each and hold a tasting, of course! So today I’m comparing the Jin Die Organic and the Yunnan Da Ye, both from Camellia Sinensis’s vast catalogue, and both harvested this year! First off, I have to say that these teas are really very similar. If I had to try them blindfolded, I might not be able to tell them apart. Especially after the second steeping, the differences in flavor and mouthfeel nearly vanished. They are both excellent examples of a Yunnan Hong Cha. That said, after four infusions, I think I have a slight preference for the Jin Die. Very slight. While both teas have the characteristic Yunnan woodiness and cacao sweetness, the Jin Die consistently had a thicker mouthfeel and a more milk-chocolate taste. The Da Ye, in comparison, was somewhat thinner and dry in the mouth with something of a blackberry sweetness. The cacao and berry flavors are what really draw me to these teas. Compared to other Chinese black tea, those from Yunnan have a special characteristic of dry grass and earth that is usually very distinguisable. In many ways this makes sense, as the leaves used to produce these teas are from the same regions (and maybe even the same plants) as the world’s Puer supply. Drinking a young Sheng Puer from Menghai I notice the same sorts of flavors and textures. Even closer is the taste of Mao Cha, the raw leaf used to make Puer, so I think the character is just inherent in the leaves of that particular province. While my preference for the Jin Die was pretty much by taste and not strength of infusion, it’s probably worth noting that its leaves were almost entirely whole and unbroken while those of the Da Ye included quite a few broken pieces. This made the Da Ye infuse ever so slightly stronger and faster than its competitor. Storage and transportation aside (the broken leaves could have easily been the result of the bag I stuffed them in), probably the main reason for the wholeness of the Jin Die is that the dry leaves are rolled into beautiful tight curls. I suspect this small detail protected the leaves from the more destructive parts of their journey from China to my tea table. For the first two infusions I used 95°C water for 45 seconds and at the third I increased that to 1 minute for both teas. I easily managed four infusions this way and I suspect I could have continued for another three without losing the flavor. By the fourth infusion, however, the teas started to taste very much the same, and so the comparison became less important. This may be the first time I’ve had a preference for a certified organic tea when tasted side-by-side with a non-certified cousin, which was pleasing in itself. Organic certification is an ongoing (and expensive) struggle for many small farmers in China and I believe that it’s only thanks to the support given by big Western importers that has enabled tea like this Jin Die to be produced and sold at a reasonable rate with that certification intact. Altogether I can easily recommend both of these Hong Cha for the lover of Chinese tea. 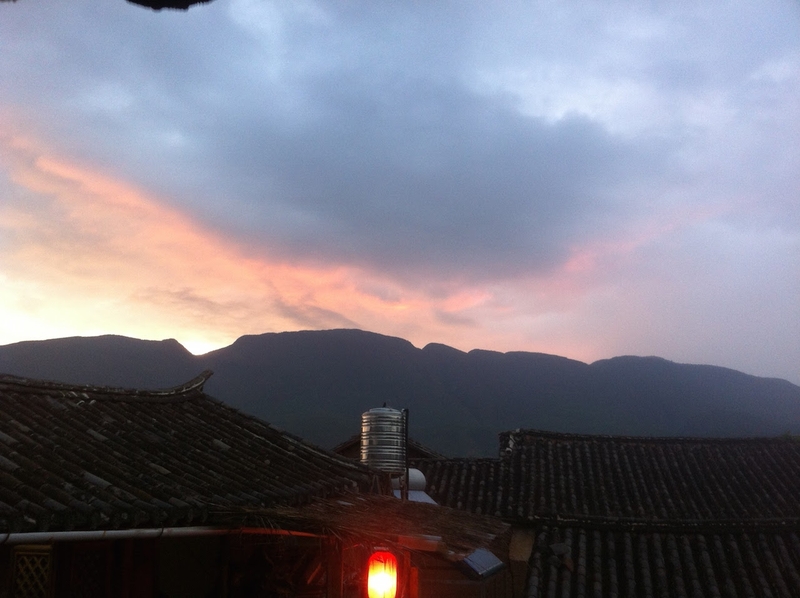 I know that I’ll be drinking them frequently and reminiscing of the beautiful Yunnan sunset with every cup. This entry was posted in Tastings and tagged camelliasinensis, china, hong cha, hongcha, yunnan on July 20, 2015 by payton. I saw my first tea pet the first time that I saw someone brew gongfu tea. It was a smooth stone turtle, serenely resting on the bamboo brewing tray, the tea flowing gently off its back as the tea master doused it with a rolled oolong. “A gift for the tea gods”, he said, or something like that, and I could sense the beautiful humility of such a gesture. Since that day I have met many tea pets, from nosey water buffaloes to tiny stoic scholars, and they continue to be a small clay reminder that tea is meant to be shared. If you have never encountered a tea pet, let me introduce you! Quite common in China and Taiwan, these little clay statues sit with the tea equipment and await a bath. They come in many shapes and sizes; often they take the form of a traditional good fortune animal like the pig, turtle, dragon, dog, or water buffalo, but sometimes one will find a lucky cabbage, a log, whimsical spider feet, or a tea master of old such as Lu Yu. There’s even special versions of these unique items which are interactive. If the clay is carved just right, sometimes the water flowing over the mouth of the tea pet will form cute little bubbles. There are plastic-like tea pets that change color with hot water like the toys I used to get in cereal boxes. However, despite these fun mechanics, it’s important to understand that a tea pet is more than just decoration! When preparing tea in the gongfu (essentially “with skill”) style, there’s usually a lot of water thrown about. Firstly the pot and cups must be warmed, then sometimes the leaves will be rinsed, and when the first infusion is steeping, some extra water is often poured over the pot to seal in its heat. At each of these stages, the used hot water or tea is poured out into a bowl or onto the table itself. Rather than simply waste that water, however, some can be poured on the head of a tea pet sitting nearby. Why would you do this? It’s certainly extraneous to the act of preparing the tea! Each tea devotee may have their own reasons, but in my experience this ritual serves the dual purpose of cultivating mindfulness and intention. Firstly the action of allowing extra drops to fall on a specific target keeps the mind present on every act of making tea, including the rather mundane process of disposing of water down the drain which might otherwise be unconscious. And secondly, this gesture serves as a reminder of the intention of kindness toward others, even if only making tea for one’s self. “Sharing” some of the tea with the tea pet, perhaps even the last drops of each infusion, can give the practitioner of the leaf a sense of connection with all of the beings in the world. With the extent of the Internet these days it’s much easier to find a Chinese-made tea pet than it once was, but I encourage everyone to find a tea pet that suits them from any source. A few of my favorite “tea pets” are just small artifacts made of clay, stone, crystal, and plastic that were never intended to be used in a tea service, and they perform the task quite admirably! Making a tea service your own is the highest form of tea art, in my opinion, and connecting with a tea pet is just one way to bring that experience to life. I hope you find a tiny friend to share your next pot! This entry was posted in Teaware and tagged china, gongfu, gongfucha, teapets on June 23, 2015 by payton. Last weekend I gathered some friends together to get to know a handful of my Shēng (生, raw) Puer. I confess that most of the time I drink Puer I go for my favorite Shóu (熟, ripe) cakes. The deep, earthy flavors are very comforting and they tend to pack less of a punch. Also, many of my Sheng cakes are either too young to be tasty yet or expensive enough that I often think I’m saving them for a special occasion. It was easier, therefore, to create a special occasion just for them! After a lot of discussion we picked four teas that were different enough that we hoped would give us a good range of tastes. A 2007 Yiwu, a 2007 Yinzhu factory bing, a 2009 Nanuo Shan, and a 2013 Yibang rounded out the circle. The Yiwu was the darkest infusion of the four (9g each, with one rinse and then a 30 second steep) and had the largest, darkest leaves. The first infusion ended up with a fruity, cherry-like taste and a very interesting aftertaste-feeling that we could only describe as “minty”. The Yinzhu was something of a mystery tea because while I know where I bought it (Dàlǐ Old Town in Yúnnán), I don’t know where the leaves were grown. The first infusion of this interesting tea had the second darkest liquor with small, orange tippy leaves. The flavor was very surprisingly rich with a smoky, oak and peat aroma, very like some of my favorite scotch. Nannuo is one of my favorite tea mountains, so I had high expectations for this 2009 bing. The leaves were wiry and long, and with a light gold infusion. The flavor was a little sweet like strawberries, with a woody, cedar aroma. Overall, it had almost the quintessential Sheng flavor. The 2013 Yibang was the youngest of the lot and so it’s not surprising that it had the lightest liquor. Its medium size leaves were dark brown speckled with blond. Using the same steeping time was probably unfair for this tea, and it tasted a little under-infused with not much body and a light mineral bite. For the second infusion I brewed each tea for 45 seconds, partially by accident, and partially to see how the flavors would develop if they were made really strong. (This is a good point to mention that if you have never made Puer yourself, 45 seconds for a second infusion is quite long.) The result? Bitter tea, of course. But the comparison was pretty fascinating as it emphasized the characteristics I found during the other infusions. The Yiwu was very herbal, the Yinzhu gave the impression of a charcoal baked potato. The Nannuo tasted like mushrooms, and the young Yibang was bright and acidic. At the third infusion (10 seconds this time), I think each tea hit its stride. The Yiwu created a cooling, refreshingly minty feeling with a herb and cherry taste. The mysterious Yinzhu made us all think of cacao nibs, with a warm scotch peat aftertaste. Our Nannuo leaves had a woody, mouth-filling texture and a smooth, crisp Bartlett pear taste. FInally, the 2013 Yibang tasted a little like a woody green tea with a long, second sweetness in the throat. All in all most of the consensus was that the Yinzhu was the best of the bunch, but that’s just because most of us liked scotch. The dissenting opinion was in favor of the Yiwu, and indeed the unique mouth feel of that tea was both unexpected and fantastic. We all agreed that the Yibang was too young (although it definitely has promise) and that the Nannuo was a good sipping Sheng but didn’t stand out from the crowd. I’m very happy to have had the opportunity to taste these teas side-by-side with friends and I think it’s setting me on a good path to get to know my Shengs. I have a whole lot more cakes, though, so next time promises to be just as exciting. If you have never tasted different teas together, I highly recommend it. If you drink a single tea one day and then another the next day, it’s very difficult to get a sense of what sets them apart. So grab those gaiwans (or tasting sets) and get brewing! 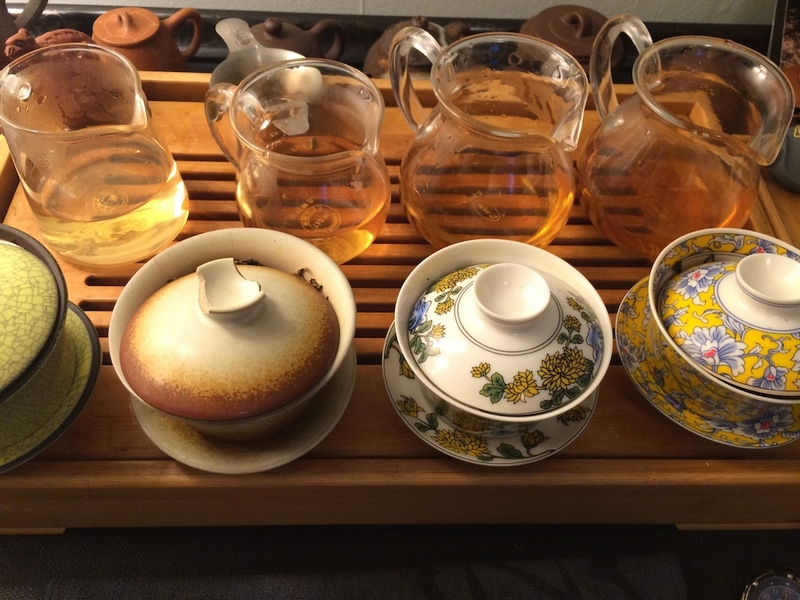 This entry was posted in Tastings and tagged puer, sheng on June 9, 2015 by payton. Ales Jurina, one of the two founders of Dobrá Čajovna (“Good Tearoom”) in Czech visited Burlington this week. Of all the people that have taught me about the way of tea, I think that Ales has affected me the most. He is a kind soul and a true tea devotee. Along with his partner and fellow tea master Jirka Simsa, Ales brought tea culture out of Asia and into the Czech Republic. From there his spirit of travel and tea adventure has influenced hundreds of tea pilgrims, tea houses, and importers since 1992. There are over thirty Dobra teahouses across the US and eastern Europe and many others which have been influenced by Dobra’s Bohemian example. If you’d like to read more about the story of Dobra Tea, there’s a good summary on their main site. This was Ales’s first visit to the Burlington tearoom (the first Dobra in the US) since it opened in 2003. In the intervening time there have been four owners, several renovations, and a large increase in tea knowledge in the West. 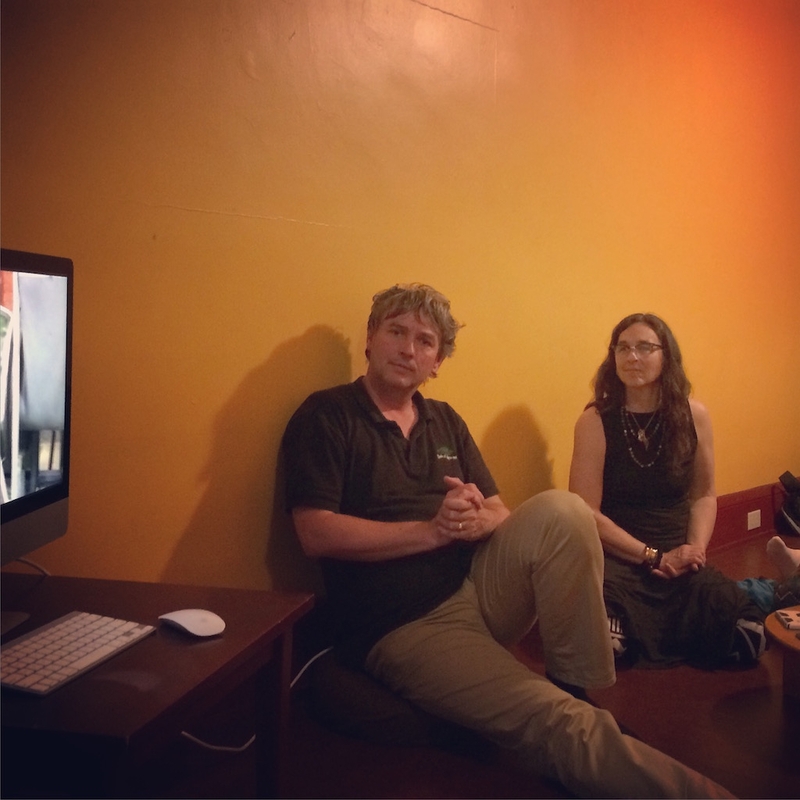 With his typical calm and humble style, he shared tea with the group, answered questions about tea culture, and showed several videos from tea travels in Japan, China, and one of the annual tearoom gatherings in Prague. 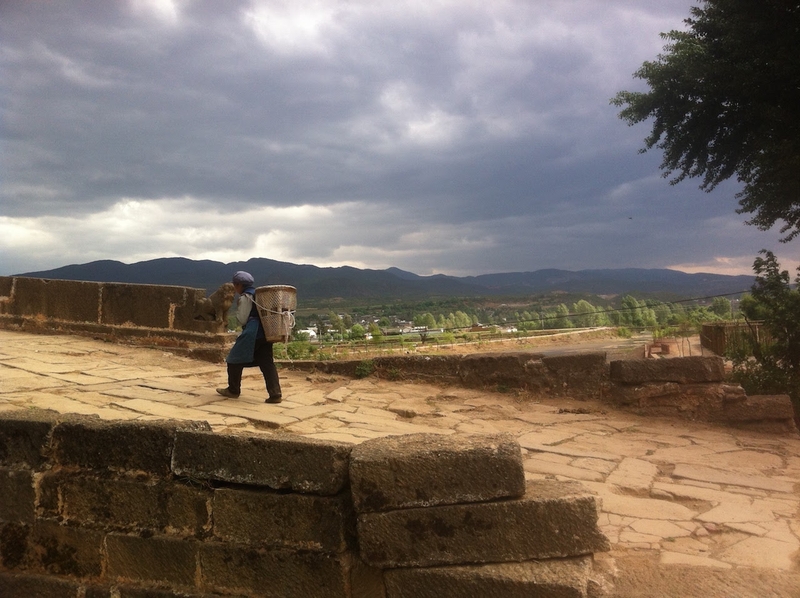 This entry was posted in Travel and tagged china, dobra on May 28, 2015 by payton.